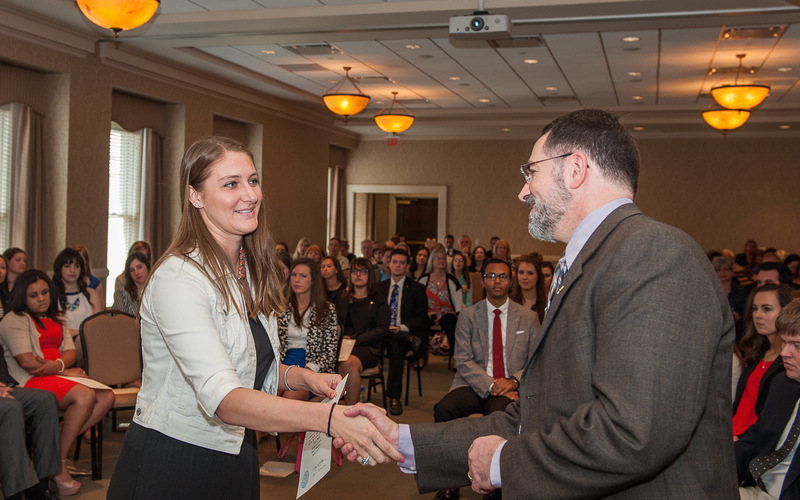 The charter circle of Belmont University’s new Omicron Delta Kappa honor society became a reality Monday as 55 students and two faculty members were officially inducted. Omicron Delta Kappa is a 100-year old national leadership honor society that has initiated more than 300,000 members since its founding. OΔK is committed to developing campus leaders who will become tomorrow’s community leaders. Founded at Washington and Lee University (Virginia) in 1914, OΔK currently has 299 active circles across the country, with Belmont being the most recent. Faculty, staff, students and alumni are all eligible to apply for membership, but due to time constraints around launching the charter circle, the Provost’s office worked with Student Affairs to target 140 student leaders who were academically qualified to encourage them to apply for the inaugural class. Of those, 55 applied and were accepted, and College of Business staff and faculty Jill Robinson, Dr. Del Devries and Dr. Dennis Chen were appointed president, vice preseident and secretary respectively. Elections will be held to determine the student officers. An invitation will be sent this summer to encourage applications for the next class, with an induction ceremony planned for the fall. Approximately 100 members per year will be inducted.